I’m always on the hunt for new and interesting ways to present small bites and appetizers at parties. I want my guests to be as excited by what they see on table as what they taste when they bite into a dish. I’m also a one-woman show when it comes to preparing for party, so trick to make getting food to the table quickly while still looking great shoots right to the top of my keeper list like a rocket. This last spring I attended the Food Republic Interview Lounge before the Austin Food and Wine Festival at the oh-so-luxurious W Hotel in downtown Austin. And while the Food Republic interviews were fun, funny, and interesting, I found myself salivating not only over the excellent “snacks” provided by the W’s restaurant TRACE, but by the simply creative techniques they used to present the food. I’ve been hanging onto my photos of the event for months because I knew they would come in handy this holiday season as I plan for open houses, dinners, and gatherings of all types. I hope you’ll find some inspiration in them as well. 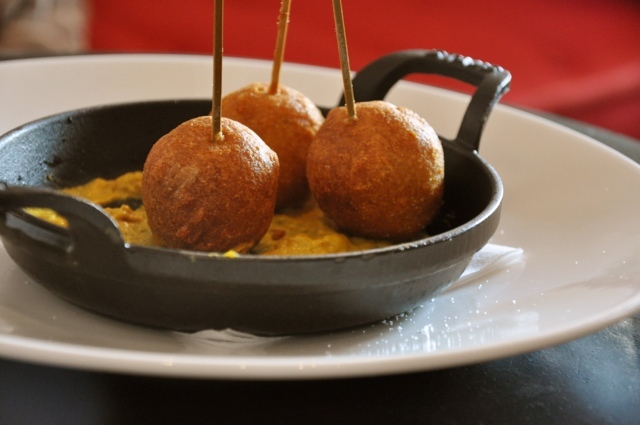 The culinary team at the W used mini Staub cast iron skillets for several different presentations, including a whimsical twist on state fair food with corn dog balls resting right in bright yellow mustard for a nice color contrast. 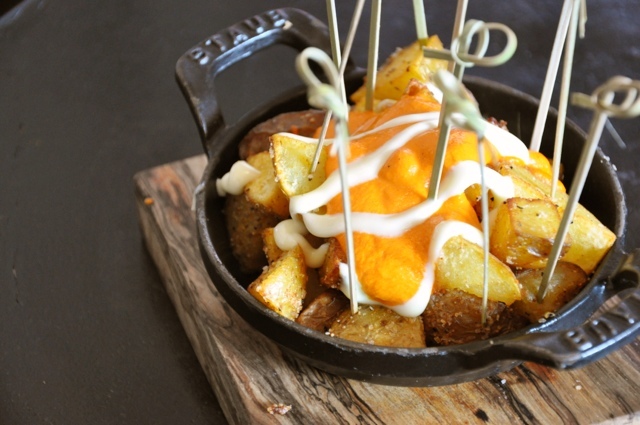 They also piled papas bravas into these little skillets, doused them in romesco sauce, and added a few toothpicks for good measure. Both of these presentations needed little more than the skillet to make them stand out. And even in a distinctly upscale setting, the skillets fit right in when sitting on an elegant white plate. It’s a little bit unexpected and a lot of fun. I also really like how they just piled the potatoes right on up instead of lining them up in neat rows on a platter. It’s certainly a faster way to serve the food but more than that it encourages communal snacking as everyone gathers around the plate to grab a toothpick and dip their potato in some sauce. And speaking of toothpicks, how great are these mini-bamboo skewers? They bring their own interesting dimension to the dish and trump ye ol’ toothpick. You can buy them in all sorts of lengths to compliment the food and serving dishes you’re using. I buy them in bulk to have on hand throughout the season. While the Staub cast iron can be pricy if you want to buy a whole slew of them, you probably only need a couple or three on hand. You can of course cook in them year round the make individual portions of mac and cheese, french toast casserole, roasted veggies, and more. To achieve a similar visual affect at a nicer price-point, try these colorful Italian Ceramic soup bowls from Sur La Table. They put them on sale every so often, so keep an eye out and stock up. Often just a few quality ingredients, prepared simply and presented well, are all you need to put together a great dish. The W cooked up some house made lamb sausage, sliced it into two-bite pieces, and served it on a schemer of tzatziki sauce. The tzatziki would have been lost on a white dish, but because this one had a hint of color to it, the colors worked well together for a tasty pallet. And while the folks at Trace make their own sausage, you can find high-quality fresh sausages from artisans in most places these days. In Austin I look no further than Dai Due or in the butcher’s cases at Whole Foods or Central Market. 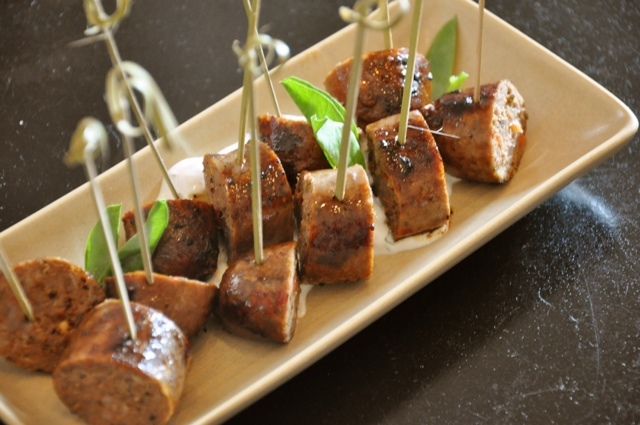 Sauces like tzatziki come together quickly you can pair just about any quality sausage with a sauce in this presentation for appetizers in a flash. Vegetable platters get tired quickly. 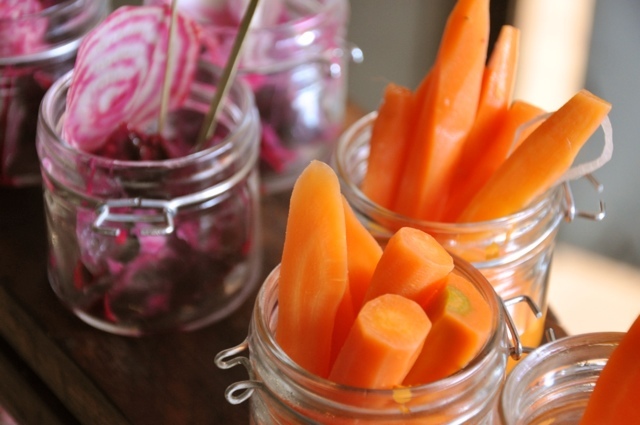 It’s great to have a selection of crunchy, fresh crudites on hand to help balance out the carbs and heavy foods you often find on holiday menus. There’s no rule that says you have to arrange them in rows or circles on a platter. Instead, take your cue from the W and pile them into jars or glasses for a completely different look. You can buy mason jars in bulk online, at restaurant supply stores, or even at hobby stores like Michaels. They are a fun way to serve salads, desserts, and even ceviche so you can use them year round. You can also look to the glassware you already own for fun ways to arrange veggies and fruit. Martini glasses are great for tomatoes and slices of cucumber, serve long strips of carrot or even asparagus in water glasses, and put olives in highballs. 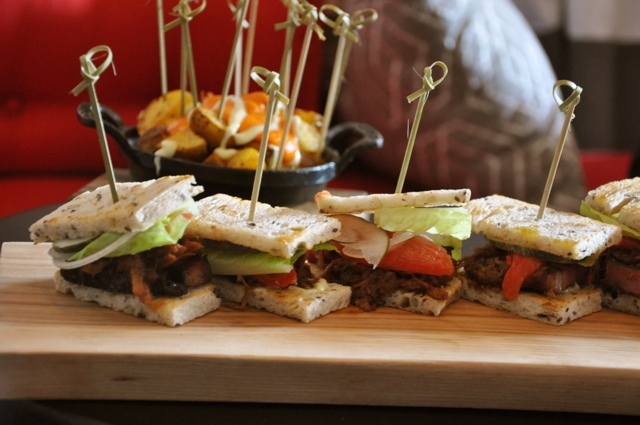 You want the sandwiches to be overflowing, just calling out to guests to pick them up, squish them a little, and take a hearty bite. They also don’t have to be picture perfect – the haphazard stacks are part of the charm and will save you a little bit of prep time too. In this presentation the bamboo picks make another appearance (so versatile they are) and the arrangement on a cutting board creates the illusion that the sandwiches were just made, just for your guests. Serving on a cutting board great way to make use of equipment you already have in your kitchen, and the wood brings some texture and color variety to the table. Loosen Up! Have Some Fun! I tend to be overly obsessed when I’m setting up a holiday buffet or service that everything has to be “just so” and presented as a caterer would. The event at the W reminded me that fun and easy presentations can be just a powerful as very precise and elegant ones. They may even encourage your guests to loosen up a bit and help jump start the mixing and mingling. Do you have a favorite easy, simple, or unexpected presentation trick? Do tell in the comments.